The night was topped by a pair of brand new AED 240,000 (about $65,000) conditions events—the Nad Al Sheba Classic presented by Longines V.H.P. Collection over 2000m on turf and Meydan Mile sponsored by Azizi Riviera over 1600m on dirt—that could eventually become top events on the Meydan racing calendar if their first impressions were any indication. As a whole, the night’s seven races left copious clues of horses to watch for next season and made many an onlooker hopeful for even more excitement in 2019-2020. 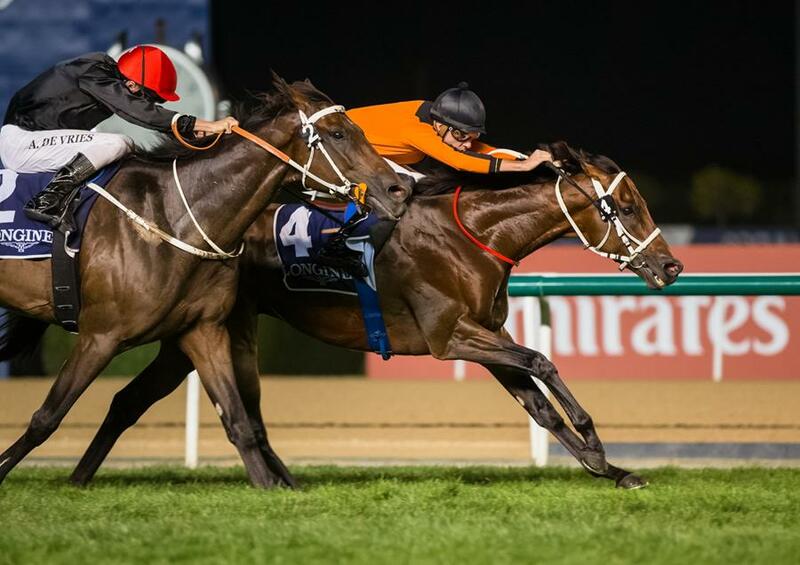 The inaugural Meydan Mile, sponsored by Azizi Riviera and taking place 35 minutes prior, was a wide-open 1600m conditions contest that could have gone to multiple on paper and appeared equally as up for grabs at the top of the lane. Thegreatcollection, under a brilliantly patient ride by Adrie de Vries, was held up behind a wall of foes before the proverbial seas split and he burst through an opening to defeat chronically wide stablemate Galvanize (Pat Dobbs up) and a hard-trying Rodaini (Connor Beasley up). The final time was a smart 1:37.01 and the victory was his fifth lifetime from 17 starts. The final winning margin was 2¼ lengths for the 5-year-old gelded son of Saint Anddan. The evening got underway with the Al Tayer Motors Maiden over 1400m (seven furlongs) on turf that was won in promising style by Jaarim, a WinStar Farm-bred half-brother to multiple stakes winner Bayerd. With Adrie de Vries in the saddle for main employer Fawzi Nass, the son of Distorted Humor tracked nicely in mid-pack on the rail before tipping out to find room turning for home. After briefly struggling to find his path, he gained clearance and zeroed in on favourite Dark Thunder (Pat Dobbs aboard), who appeared to be a winner at the time. Spoiling said rival’s hopeful graduation, the bay 3-year-old colt won by a half-length at the wire for his owner-trainer, annexing his initial victory in his third lifetime start. Rayig was another neck back in third under Fernando Jara. The final time was 1:25.64. The second race, the Azizi Mina Handicap over 1200m on dirt, was won in gate-to-wire fashion by Chess Master, who ran the board with aplomb from his rail post, stopping the Longines clock in 1:11.17. Ridden to perfection by Antonio Fresu for Musabbeh Al Mheiri, he bucked his long odds, as well hand previous form that saw him finish behind race favourite Lytham St Annes, who checked in third this time under Pat Dobbs. He was 1¼ lengths astern Leading Spirit (Richard Mullen up), who was 4½ lengths behind the promising winner. A 3-year-old son of Shamardal, Chess Master is a son of crack sprint filly Cassandra Go, who was second in the July Cup (G1), making him a half to Irish 1000 Guineas (G1) winner Halfway to Heaven. In a severe reversal in form, HH Sheikh Hamdan bin Mohammed Al Maktoum’s Manahir closed like a rocket to run down a tough-luck runner-up in Pillar of Society (Pat Dobbs up) in Race 3, the Gulf News Handicap. Ridden by Royston Ffrench for Salem bin Ghadayer, the winning son of Naaqoos was two lengths clear after his closing trip, finishing up the 1400m on turf in 1:24.67 after a final furlong (200m) in 12.48 seconds. It was another neck back to Yaalail and Fernando Jara in third. The winner won for the fifth career time (all on grass) from 22 lifetime starts. He had never factored on dirt from five tries, including a 11th-placed drubbing last out on March 14. The Al Tayer Motors Handicap was the final in a storied career for multiple Grade 1 winner Furia Cruzada, a multiple Dubai World Cup alumnus and local Group 2 winner. After a career that has seen her compete in Group company on three continents, she went out fighting to a fine second-place finish to promising 5-year-old Mudallel, who was ridden to perfection by Connor Beasley, finishing the 2000m in 2:04.88. Furia Cruzada and Antonio Fresu were 2½ lengths back and a neck ahead of Group 3 winner Montsarrat. The winner won for the first time on dirt from four tries, while earning a fourth lifetime tally from 21 starts. Furia Cruzada finished up her career with a record of 7-6-7 from 40 starts. The final race of the 2018-19 UAE racing season, the Longines La Grand Collection Handicap was won in brilliantly determined fashion by Ahmad bin Harmash-trained Carrington, who held off a stubborn Fernando Jara-piloted Almoreb throughout the stretch to win by a neck. The victory was the 6-year-old son of New Approach’s fourth from 19 lifetime tries as he finished up the 1800m on turf in 1:50.39. It was another 1¼ lengths back to Valcartier in third. The UAE racing season championships for owner, trainer and jockey titles were also sewn up and awarded on the night, with said titles going to the same team that won the Group 1 $1 million Dubai Kahayla Classic on Dubai World Cup night with AF Maher: owner Khalid Khalifa Al Nabooda, trainer Ernst Oertel and jockey Tadhg O’Shea. “It's great and I had a tremendous year,” O’Shea said immediately after accepting the award.